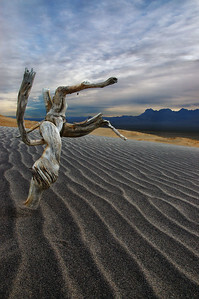 If you’re looking for a little more seclusion then the more visited dunes of Death Valley try the Kelso Dunes. Although just like the dunes at Stovepipe Wells there is main walkway from a parking lot area but you can leave this freeway of foot prints and veer off to the east or west and truly lose yourself into the void of 45 square miles of dune field, the largest in the Mojave Desert. Slide down from the top of 650ft high Star Dune on a hot day and listen to the odd booming vibrations. Make sure you are gassed up and have plenty of water and snacks it’s one of those out of the way special places. There is a small coffee shop inside the Kelso Depot but it’s not always open so make sure you check before you plan on stopping there. If you have time the Mojave Preserve is an under appreciated place in the desert with many other unique photo opportunities. From a first visit back in 2006. Equipment needed: The bare necessities and whatever else you may have. Photography is about seeing creatively not about what you have in the bag. 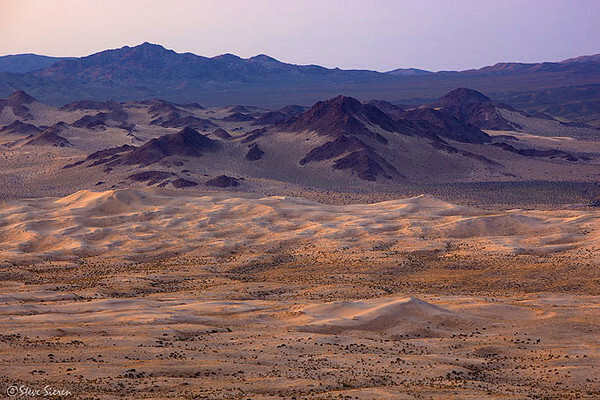 Getting there: The Kelso Dunes are located between I -40 and I – 15 towards the Eastern California border. Kelbaker rd connects to the 2 freeways, it will take you there. There is sign for the dunes a few miles south of Kelso. From here a dirt road with the dunes in view will take you 3 miles to the parking lot. 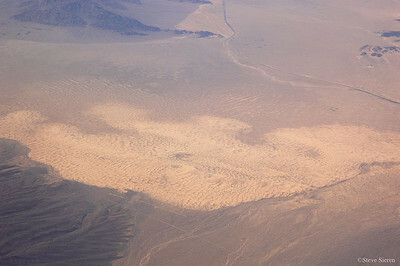 The extensive view of the dune field from the air. This entry was posted on May 25, 2010 at 7:24 am and is filed under Uncategorized. You can follow any responses to this entry through the RSS 2.0 feed. You can leave a response, or trackback from your own site. Great site, I have driven thru the reserre but did not make it to the dunes. Wonderful area and would love to go back for a longer visit. Love the light on the dunes. Thank you Glen and Derrick, I’ve been by other photographers that there is nothing out here but I’m going to try to prove them wrong. I’ve been told by one of the desert rats that there is a volcanic fin that rises a few hundred into the air. At the winter solstice the sun shines through a hole in the top of it creating an interesting photographic possibliy. Of course all I got was a vague discription on it’s where abouts but if it’s out there I will eventually find it. Not exactly in my neighborhood, but it looks like a fascinating place. Maybe I’ll get there one of these days. Hope you find that fin — I’d love to see the photos of it. I’ve only been there once and found it difficult to photograph. An injured knee made walking in the dunes a pure joy…. I thought it would be a nice place to check out if it ever greened up, but from your post it sounds like there’s a lot more to explore than the dunes you see from the parking lot. Hi Steve, I like that second one you made when you first visited. This post has given me great joy to find out that photographers feel it is not much to photograph. I am happy to hear this and hope this rumor continues. Please limit your posts about this area, Steve. We wouldn’t want to have huge numbers of people with tripods out there at sunrise like there is in Yosemite and Death Valley. This is for your knowledge only, don’t tell anyone that Philip Hyde loved the place and made some stunning photographs of it. One of them appeared in his book, “Drylands: The Deserts of North America” and is on the Philip Hyde website. Ssshhhh. PJ, The heat should keep me out of there for a few months. That should make for two months to find it before the solstice happens. The Kelso dunes are quite different and full of plants. That is why most photogs do not visit them. The plants can throw people off. All dunes are unique in some way and showing why they are unique is a great idea. John, It’s a tough hike to get up to the top. My first trip up was killing me and I was in better shape then but now I find hiking endurance and being in shape two different things. Take care of those ligaments, once the elasticity goes they turn to jello. I skipped out on surgery and it doesn’t go out and swell up anymore. They are supposed to make the Preserve larger so let’s hope that happens. David, With the growing population of photographers that’s going to be tough to keep it that way. The amount of services should keep people in other places and thank god for icons. Since we’ve been chatting I do have that book now David. If I had it when I started it could of saved me some research time for the Mojave. They have done some upgrades there and one the upgrades has rendered one of my photos timeless.